Barbers were proud of their chairs. 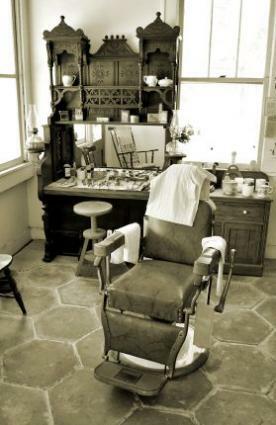 More than just a utilitarian piece of furniture, antique Koken barber chairs are actually works of art. Because of the gorgeous materials and craftsmanship in these chairs, collectors now seek them out and pay thousands of dollars for them. In the late 1800s and early 1900s, the Koken Barbers Supply Company crafted thousands of these chairs for barbers throughout the country. Located in St. Louis, Missouri, Koken was more than just the largest barber supply company in the United States; it was also the brand of barber chair. The company's founder, Earnest E. Koken, held patents for several important barber supply products. One of these was a hydraulic-powered barber chair, for which the company eventually became renowned. In the 1950s, the Koken Barbers Supply Company went out of business. For a time, a Japanese company used the Koken name to produce barber supplies. Craftsmen used only the finest materials to manufacture many models of Koken barber chairs. Many examples feature tufted leather seats, padded arm and foot rests, and frames constructed of quarter-sawn oak or walnut. The frames sometimes often featured elaborate wood carvings. On these chairs, even the metalwork was elaborate. The seat brackets, parts of the footrest, and the base all have beautiful scroll designs and high-quality craftsmanship. Some of the most valuable antique Koken chairs feature working hydraulic lifts for which the company was famous. These chairs have a wide range in value, which varies depending on the chair's condition, age, and features. At the low end of the value spectrum, a complete Koken chair with major condition issues might sell for less than $500. A chair in this price range could have some rust, major upholstery issues or poorly replaced upholstery, and would probably date from the 1940s or 1950s. It would likely not feature elaborate carvings or a working hydraulic lift. A more sought after Koken chair could sell for as much as $5000 to $6000. This type of chair would be in perfect condition and would have a working hydraulic lift, beautiful wood carvings, and original leather upholstery in perfect condition. It would probably hail from the early 1900s. Get the chair appraised by a second source. Don't simply trust the seller's price for the value of the chair. If buying online, include a contingency clause about the condition of the piece. Photos do not always show water spots and other damage. Be clear about the chair's condition and storage history. Many of these chairs received hard daily use, and their condition has a great deal of effect on their value. Have fun! Koken barber chairs are a classic and lovely decorating piece for your home or business.